Have a question about Protein Jelly Mix? What is it, what does it do, how and when to use or something else? Ask us. Other Ingredients: Whey Protein Concentrate 80 (62%) (milk), gelatine (bovine) (30%), natural flavour, natural colour (beetroot red), sweetener (sucralose), emulsifier (soy lecithin), DigeZyme® (amylase, protease, cellulase, beta-D-galactosidase, lipase), LactoSpore® (Bacillus Coagulans). ALLERGEN INFORMATION: Contains whey, milk and soy. Add 150ml of boiling water to a bowl, and then add one scoop of Protein Jelly Mix and whisk until the powder is fully dissolved in the water. Add a further 100ml of cold water and give the product a final stir before placing in the fridge to set for 30-90 minutes. 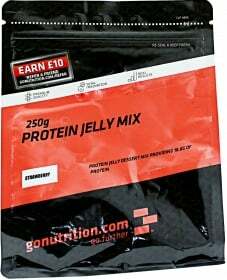 For a thicker protein jelly, or to make protein jelly sweets simply use less liquid. Do not use hot liquids in your shaker. We recommend consuming your Protein Jelly within 24 hours of making it up.